How are Vision Zero, Safe System, and Traffic Safety Culture related? Vision Zero is a statement about our desired future by declaring that zero is the only acceptable number of traffic fatalities and serious injuries. This vision is motivated by the widely shared value of protecting the health and safety of everyone using our roads. Vision Zero makes explicit that death and disability from traffic crashes are unacceptable in our society. Safe System refers to an approach for achieving our Vision Zero. It recognizes that we can only achieve Vision Zero by taking a systems approach and integrating efforts amongst all traffic safety stakeholders (road designers, vehicle manufacturers, policy makers, enforcement agencies, families, workplaces, schools, etc.). A Safe System approach seeks to design, build, and maintain a transportation system that promotes safe road user behaviors and protects all road users from physical harm. All stakeholders in this system are responsible for reducing crashes and the harm they cause – even when road users make mistakes. Traffic Safety Culture includes the values, beliefs, and attitudes that influence road user behaviors and stakeholder actions. Behaviors and actions occur in a social context and are influenced by social factors of the groups to which we belong (families, friends, workplaces, agencies, communities, etc.). As social beings, we are naturally motivated to choose behaviors consistent with the culture of the groups with whom we identify. Thus, our goal is to cultivate cultures amongst all groups that promote safe road user behavior. By growing a strong Traffic Safety Culture, safe road user behavior is reinforced and sustained by the social dynamics of the groups. Vision Zero and the Safe System approach are also based on a specific set of values and beliefs. For example, Vision Zero values safety above all other priorities and the belief underlying the Safe System approach is that Vision Zero can only be achieved by integrating safety efforts across all stakeholders. To be implemented successfully, the Traffic Safety Culture of traffic safety stakeholders must align with these same values and beliefs. 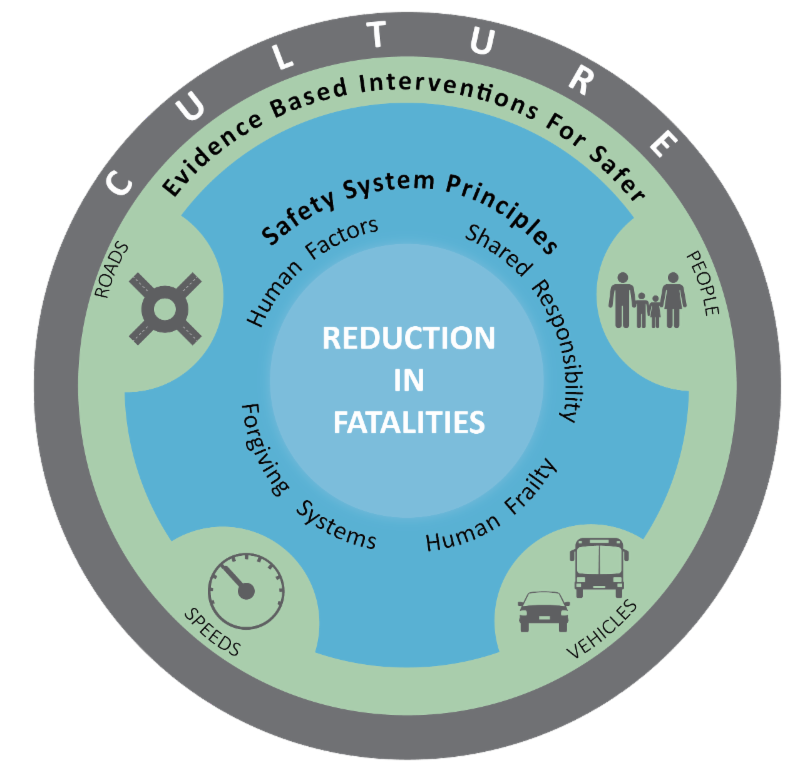 Thus, one use of Traffic Safety Culture is to measure stakeholder culture and develop strategies that align their culture with both Vision Zero and the Safety System approach. This includes creating a shared culture that encourages and supports the coordination and integration of safety actions across all stakeholders. At the core of the Safe System approach is the need for safe behavior by all road users. Thus, another important use of Traffic Safety Culture is to measure road user culture and develop strategies that transform this culture to encourage and sustain safer behaviors. Ideally, this will result not only in road users choosing to be safer because such choices are now viewed to be part of their own culture but also helping other people become safer too. General References: Safe System (http://roadsafety.gov.au/nrss/safe-system.aspx) ; Vision Zero (http://www.towardzerodeaths.org); Traffic Safety Culture (https://www.youtube.com/watch?time_continue=1&v=KCMxAktDsE0).